- Bird bath should be no deeper than 3"
- Use drippers in bird baths to keep a supply of fresh water. Chicakdees and gold finches love to provide entertainment as they drink directly from the dripper. - Use a mister. Hummers, robins, cat birds, and wrens love to play in the cool mist. 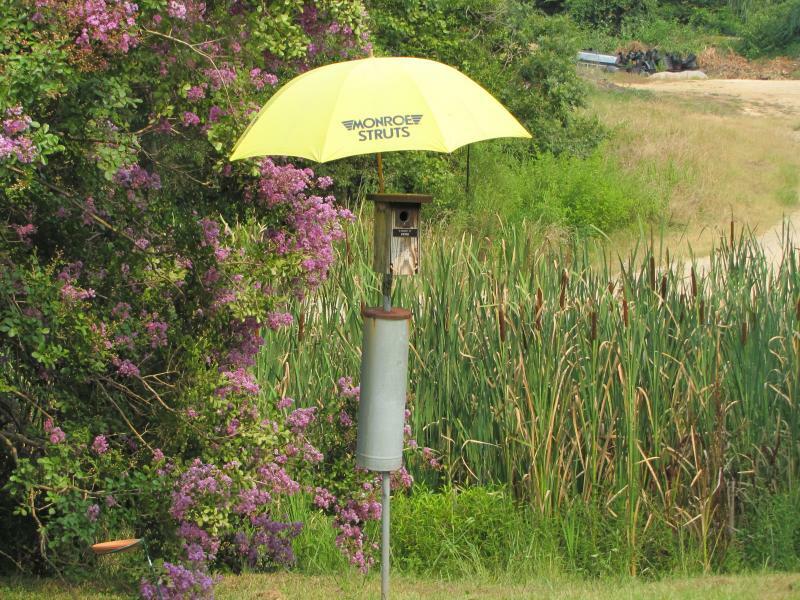 - If birds are nesting in a bird house in the full sun, provide shade with the help of a large light colored umbrella! If you have one of our new houses with a white roof the babies stay much cooler. Any house with a dark roof heats up with the sun on it, keep babies from "cooking" in this heat by providing shade. Step back and watch to make sure mom will go back in to feed. . . I have never had a bluebird abandon the nest with my big old umbrella to keep them cool. 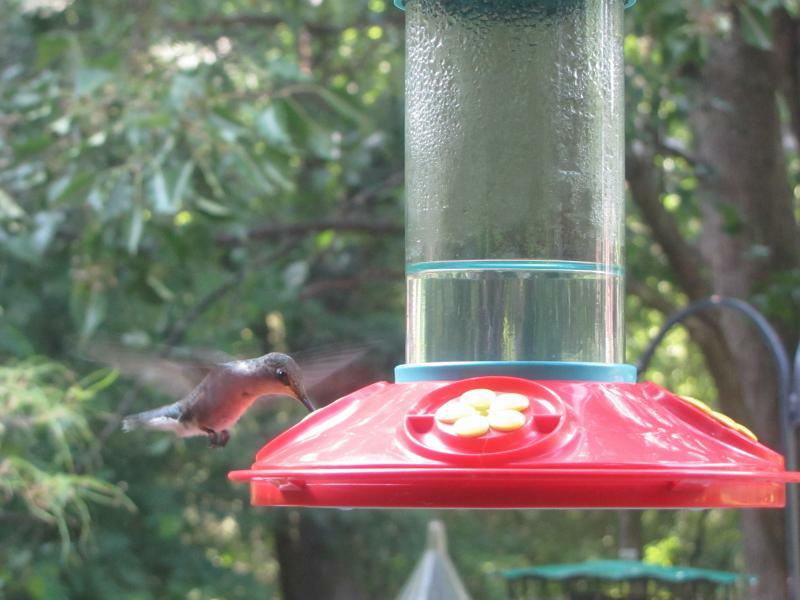 Keep your hummingbirds coming back to entertain by keeping feeders clean and nectar fresh. - Change nectar at least 2 times per week in this heat. - Scrub feeders each time you change solution to prevent mold from forming. - To clean a moldy feeder, use a vinegar and water solution. No need to boil if you only make up enough for each feeding - don't plan to store it. - Check out our Dr. J.B. Feeder - It's easy to fill (I mix my sugar and water right in the jar.) It's also easy to clean (dishwaher safe). All parts are easy to reach for cleaning. -To bring hummers up close try our Jewel box feeder that mounts on the window. It has a built in ant moat and is easy to clean and fill. Provide plenty of fresh food - seeds, peanuts, suet, and mealworms. - My greatest pleasure in feeding the birds in the summer is watching the new babies come to the feeders, begging and then learning to eat on their own. - Suet provides hgh fat, high protein and an easy way to help parent birds feed their young. I have Catbirds, Cardinals, Woodpeckers, Nuthatches, Wrens, Titmice, Chickadees (to name a few), all leaving the suet cakes with large plugs of suet in their mouths to feed babies. Keep a ready supply! -Mealworms are to bluebirds what Chocolates are to women! They love them and by providing an ample supply parents have a little easier job raising all those babies. Each baby bluebird is fed five times per hour and each nest us has 4-6 babies. . . that is 20 -25 meals per hour! We keep a supply of mealworms all year long at Raywood. Cardinals, Titmice, Chickadees, Carolina Wrens Woodpeckers and many other birds enjoy mealworm treats too! ***Mealworms are the perfect food to train birds to eat from your hand!